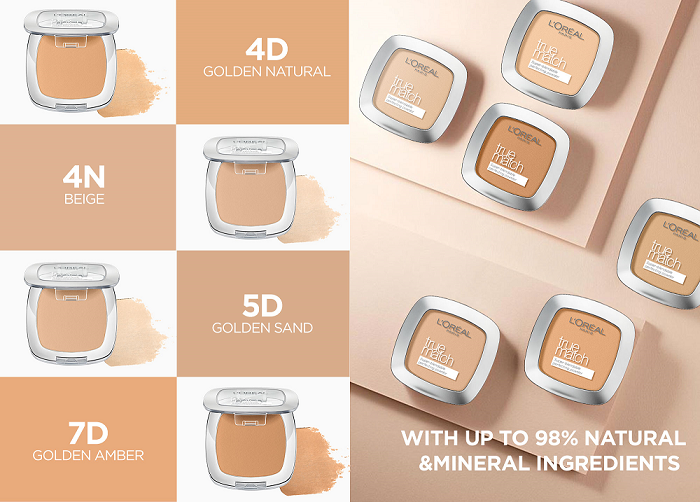 L'Oreal Paris True Match Skin-Caring Skin-Matching Pressed Powder is the 1st ever powder that cares for your skin. With skin-hydrating benefits and up to 98% natural ingredients and mineral pigments, get that lightweight velvety soft formula without clogging your pores. Recommended by dermatologists, True Match Powder is safe to use even for the most sensitive skin. 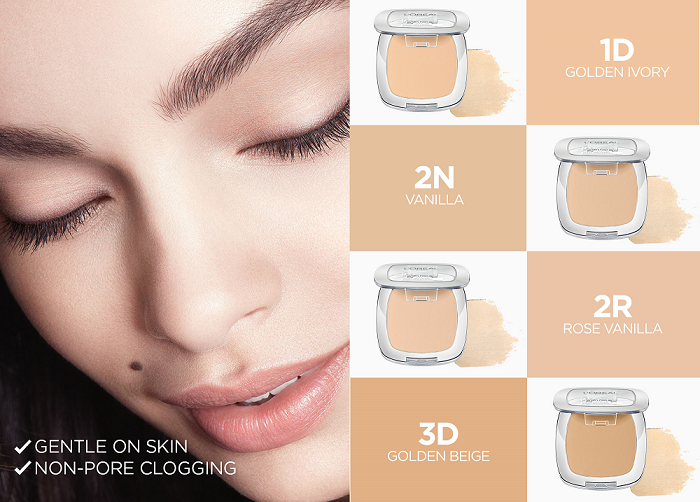 With 8 skin-matching shades that's perfect for Filipina skin-tone, you’ll easily find the shade that’s right for you! View L'Oréal Paris Official Website or Instagram! My skin feels more hydrated after extended use of True Match Pressed Powder. The powder is lightweight and gentle on my skin (does not irritate) even after extended use. I really appreciate the way that you combine such pure techniques with science to create a very wonderful product. It really helps me alot to fight those blemishes that I hide. And now this product pushes me to believe more to my self it really helps me to come up with my dry skin and pimples. it's a perfect for my face. super like it. Coverage is light, but it's buildable. I noticed that the powder itself is very fine and as the name says, it's super blendable. You won't have any problems applying it using the sponge or a brush. As mentioned, the effect when applied is sheer. With that, you can re-apply it anytime you want and it will still not give you that heavy feeling. It also gives a matte finish, perfect for oily skin. I love that it is easy to apply and blends perfectly on my skin. It’s also cery portable making it easy to carry anywhere you go. It also comes in various shades so it’s easy to choose the one that suits your skintone. First off, I want to inform you, reader, that I have a combination skin with a really oily T-Zone and really dry cheek zone. It is really NON-PORE CLOGGING, YAY! The afternoon I received the free product by tryandreview, I used it immediately. Then came bed-time, I was really tired from my work online so I slept with the product still on my face. (Don't judge me. Hard working mom here! Haha) My usual powder would clog the heck out of my pores if I forgot to wash it off before going to bed but came morning the next day, I was pretty pleased to know that Lóreal True Match Super Blendable Perfecting Powder DID NOT CLOG MY PORES AT ALL. I washed my face in the morning and TADA! NO trace of it anywhere on my face especially my T-Zone. Pretty impressive. When I first pat it on my face, I should say, I was really light as a feather! It was barely there! I even had to look in the mirror just to remind me if I had any make-up on! Don't judge me, I am not super kikay in this season of my life but my online job needed me to be looking presentable and neat. So yes. Super makakalimutin na ako, That's the very feel I felt when I put Lóreal True Match Super Blendable Perfecting Powder on my face. I felt as if I put on nothing! HAHA! Gentle and Smooth on skin? Uh. NO. I could have given this product a 5/5 but this statement had claimed the one point so 4/5 would best rate Lóreal True Match Super Blendable Perfecting Powder for me. NO it was not gentle on skin. It felt like I had put on alcohol because of the dryness it made my skin feel. Well, to be fair, it was not all the time, only the first time you dab it on your face and whenever you needed to touch up, Those were the times it felt super dry on me. As stated, My best rating for Lóreal True Match Super Blendable Perfecting Powder would be 4 out of 5. Not bad, I may say. but they need to work on that dry feel whenever I would pat it on my face.